I'm attending EOT this year and the last time I was there was 2009, that's nine years ago. Went the first five years at Founders Ranch 2005-2009 and all those years we shot long range for group sizes on paper. Is is that what they are still doing? I can't remember the distance and would also like to get an idea of distances they are now using. I was out at FR yesterday painting benches for EOT. I got a good look at the new "long range" bay. It looks like a good 100 yards. There usually is NO published detail ahead of time about side matches at EOT. Come prepared for whatever gets finalized as stage directions. If you have a local shooter who shoots Long Range at EOT, he'll help you more than almost anyone else. The "long range" this year will certainly be in the far south bay, and yes, that is a 100 yards maximum shot, if they set targets at back of bay. Long range competitors will need 10 rounds of ammunition and their rifle for all categories. 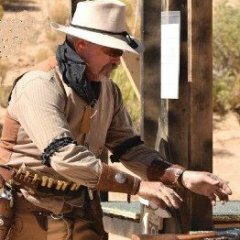 You will have 3 minutes for lever actions and 5 minutes for single shots to place 10 rounds on a target for the tightest group. This event is not scored- only the group size matters. All ten rounds must be on the paper to be measured. Awards for 1st-3rd place for Men's and Ladies.